Udemy Instructors and Course Creators, let me ask you a critical question. Are you making this mistake? If you are a course creator, a digital instructor and you publish on Udemy I would like to share a secret with you. Udemy is not your business. Udemy is your Business Partner. So far, this is how it works. You create a course, upload it to Udemy. Then when its published they take over. They originate traffic and drive it to the Udemy.com website. They get students, new and existing to sign up and enroll in your courses. It is easy to separate the two processes. You publish. They promote and sell – which they do extremely well by the way. So what are you missing here? Fundamentally you are missing the Customer. They own the customer and in return for you providing and owning the content, they provide and own the customer. This is great as far as it goes. But what if it could go further? What if you are missing out on a whole stack of traffic which you could be sending to your courses to make extra sales? This is why you must look at Udemy as your Business Partner and not your entire business. Udemy provides a fantastic and evolving hosting environment for you to deliver your online courses. The fact that they also sell your courses for you is amazing. As you know, if you sell a course using one of your own coupons – which we normally do by running promotions to our existing Udemy students – then Udemy gives you 97% of the revenue from that sale. It tells you that Udemy wants you to sell your courses yourself. Too often we simply rely on Udemy to do ALL the selling and just focus on the course creation and managing our on line students. This is where we go wrong. We treat Udemy as our Business instead of a Business partner. But the consequences of this are not to be ignored. To build a digital business with our Business Partner, Udemy, we need to learn a whole range of new skills which up to now we have let Udemy take care of. In short you need to know how to start, grow and develop a digital business around your partnership with Udemy. Just imagine all those extra 97% revenue sales. Essentially every one of your sales is worth two of Udemy’s internal sales (50% revenue) or 4 affiliate sales (25%) revenue. This is why I have been focusing on developing the digital business skills I need to develop my partnership with Udemy and I am going to be sharing them with you in the coming months. Please comment below this post to tell me what you find most difficult about growing your digital business. Please share this with your friends and invite them to join this movement of digital business transformation. 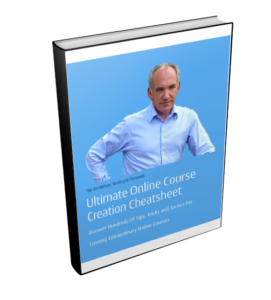 If you would like to make even more amazing and profitable online courses – then click on this link to get my Ultimate Online Course Creation Cheatsheet!